What can be better than a tour titled "The Higher Vibez Tour"? 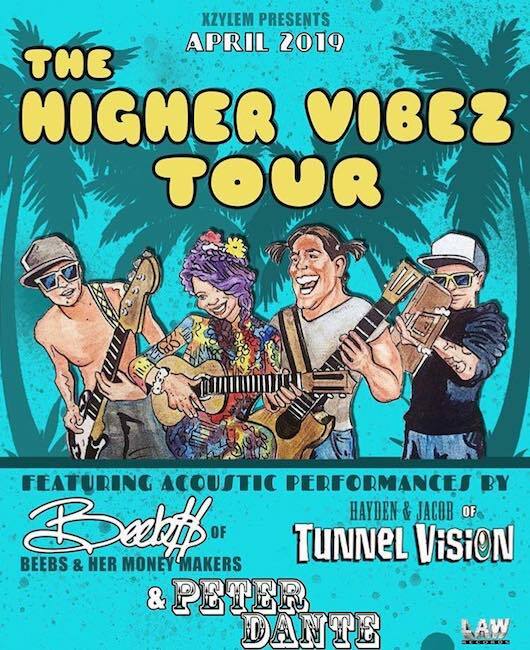 Well how about a tour titled "The Higher Vibez Tour" with acoustic performances by Beebs of Beebs & Her Money Makers, Hayden & Jacob of Tunnel Vision, and Peter Dante of Happy Madison Films (such as Grandma’s Boy, Waterboy, and Little Nicky). Beebs recently posted: "The three acts have aligned their creative talents to bring you an acoustic experience filled with new looks at popular originals, classic sing-alongs, and a charisma that joyfully captivates an audience." That sounds like some good vibez or actually I should say Higher Vibez. The tour kicks off tonight in Atlanta, GA, see below for a full list of dates.